The majority of art displayed and sold in Bozeman represents iconic ideals of the American West. Sweeping vistas of Big Sky Country and beautiful depictions of wildlife abound. “There’s a lot of Cowboys and Indians or trout and buffalo,” artist Dalton C. Brink explained. However, a few local artists are breaking the mold and trying to make it easier to find art of all genres in our area. An underground art movement is afoot. Brink is the Bozeman underground art movement’s pioneer. He created The Cottonwood Club, a place where local artists can show their work. While growing up in Memphis, Brink was inspired by the art and music that surrounded him. Small galleries and clubs were everywhere. When he moved to Bozeman, he found there was nowhere to show his work, and he wasn’t alone. “There are a lot of serious artists in this town with nowhere to show (their work),” Brink said. The Cottonwood Club’s first location didn’t work. Brink wanted to use his space for art shows and live music, citing the lack of venues appropriate for all age shows in town. Neighbors complained of the noise, and Brink had to start over, but he wasn’t deterred. It took five months, but he transformed the S. Wallace space, adding water, electricity, and walls on his own. The Cottonwood Club hosted its first show almost two years ago, and now hosts at least one show every month. Artists are welcome to display work and sell it if they wish. It is their choice. Brink noted that a lot of art is installation or performance based; there really isn’t anything to sell. 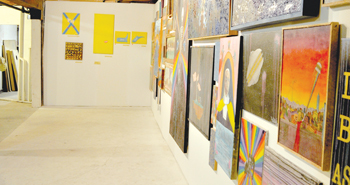 His venue provides space for artists to present their work to the world. Shows are often BYOA—Bring Your Own Art. In addition to the shows, The Cottonwood Club is home to the Free Art School drawing club. For over a year, people have been gathering from 7p.m. to 11p.m. every Wednesday night to draw. Brink has hosted fundraisers for organizations like the Bozeman Bike Kitchen as well. To learn more about events at the club, search for “The Cottonwood Club” on Facebook. Brink never went to art school, although he has been collaborating with Montana State University a bit recently. Instead, he studied nuclear engineering with the Navy. However, some MSU students share his sentiment that there are not enough venues in Bozeman for contemporary art. In May, a group of seven graduating MSU art students decided to search for gallery and studio space they could use as a group. One of the Coalition’s founding members, Jade Lowder, explained that the group is a “close-knit group of peers” that trust each other’s artistic judgment. They critiqued each other’s work throughout their education. “After graduation, we didn’t want the conversation to stop,” he said. Their goal was to “promote a different kind of contemporary art,” according to Jordan E. Thornton, another Coalition member. They recently opened a gallery in Four Corners, at 95 Spanish Peaks Drive. The Others Gallery held its first show in November, a group show that explored various phobias. 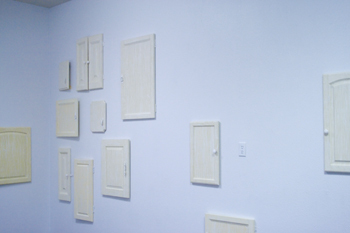 In December, Thornton had her first solo show, called “My Skeletons Prefer Grandma’s Kitchen,” which included prints and an installation piece. She graduated from MSU at the same time. Without the Coalition, she would have left Bozeman earlier. “The Coalition kept me here,” she explained. And, that is what it was designed to do. The founding members hoped to establish a place where they could take a year to stay in Bozeman and work. The Coalition is open to everyone, and they hope to get new members every semester. The seven current members are all applying to graduate school, but they hope that newcomers will join so they can pass on the Coalition if they all leave. The Others Gallery’s next show will be January 11. It is a solo exhibition by William Curtis that includes detailed, surrealistic drawings that explore personal anxieties. “It should be a great show,” Lowder said. A date has not been set for February’s show, but Lowder is planning an open call that will invite the whole community to submit artwork. Three curators will decide which art is displayed in the show. The Coalition has studio night in the gallery every Thursday night at 6p.m. They also meet every other Sunday night at 7p.m., and Lowder said anyone interested in what the Coalition is doing is welcome to attend. The best way to get more information about the Others Gallery is to email them at othersartcoalition@gmail.com. Amber Hughes has been a student of many things, one of them being art. She finds she “can’t stop making art,” and partnered with good friend Ashley Stevick in an effort to make their art more accessible. Together they created Stash Gallery in the front room of Stevick’s home at 613 W. Lamme. They use the area as studio space and open it to the public on Thursdays and Fridays from 4p.m. to 7p.m. and on Saturdays from 11a.m. to 3p.m. Hughes makes jewelry of all kinds. 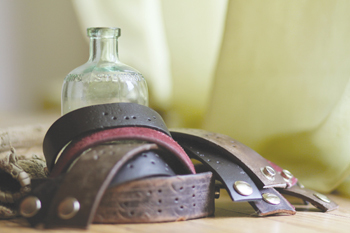 Her current passion is to upcycle old belts into cuff bracelets inscribed with Braille. She uses grommets to create the Braille lettering, and takes custom orders in addition to having a number of bracelets and other jewelry available in Stash Gallery. Stevick is the owner of Ashley Stevick Photography. She has built her business into a success, photographing portraits, weddings, and other events, but she wanted a way to sell some of her fine art photography. She explained her idea for Stash Gallery to Hughes, and the gallery went from idea to reality in less than five weeks. Stash Gallery’s grand opening in early December had a steady flow of people. The pair envision hosting monthly community nights, and eventually incorporating more artists into their gallery. “We want to be involved in the community in lots of different ways,” Hughes said. However, their primary goal is to make art affordable and accessible to everyone. A number of items in the gallery, from fine art postcards to jewelry, are priced under $20. So, if you are looking for art, but aren’t interested in the mainstream, fear not. Art is being created all over Bozeman, and it is becoming more accessible thanks to some hard-working and entrepreneurial artists. Sarah Cairoli can’t even draw a straight line, and has deep respect for those who can. She can be reached at scairoli30@hotmail.com Photos Gwen Dodge and Sarah Cairoli. If you like local Bozeman art check out our artists bios from former cover artist in our archive.